Septoria brown spot (also called brown spot) is a common leaf disease of soybean across the Midwestern U.S., according to the University of Minnesota Extension website. Its incidence can be high but it rarely develops to cause significant yield loss. Yield losses of 5%-8% may occur under severe conditions when much defoliation occurs. Where soybean rust may occur, it can create diagnostic problems because these two diseases can cause similar small, dark spots on leaves. The first symptoms usually appear on the lower leaves and then progresses to the mid-to-upper canopy throughout the summer. Initial symptoms are small dark brown spots (<1/8″ in size). It can develop on the first true leaves early in the season. 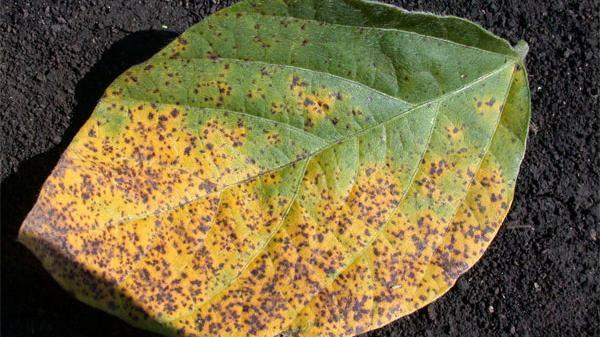 The brown spots often enlarge and grow together into irregular brown areas, which often are associated with yellow patches concentrated more on one side of the leaf than another. The brown areas can contain tiny raised specks called pycnidia (visible with a hand lens) where spores are produced. Infected leaves may fall off prematurely. Like most foliar diseases, Septoria brown spot is most common when conditions and leaves are wet and warm, ideally for extended periods of time. Because the pathogen survives and sporuates on soybean residue, minimum tillage and continuous soybeans may enhance this disease. Septoria glycines is a fungus that survives on crop residue and may be seed transmitted. Septoria brown spot typically does not require management because it rarely causes significant losses. Soybean varieties are not available with resistance to this disease, but varieties can vary in their susceptibility. 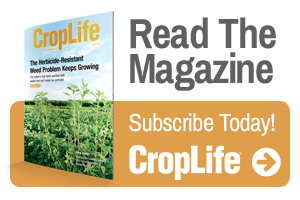 Rotation with non-legume crops and tillage may be beneficial, and foliar fungicides can provide some control under those rare conditions when an application may be warranted.